While I was at CHA, I was given a couple of stamps that I wanted to share with you. I was coloring away with my markers one afternoon when someone dropped a business card in front of me with Anna Wight's name on it. I looked up, and there she was--Anna! We hadn't met before, so it was fun to be able to put a face with someone whom I've long known as a major talent in both illustration and watercoloring. 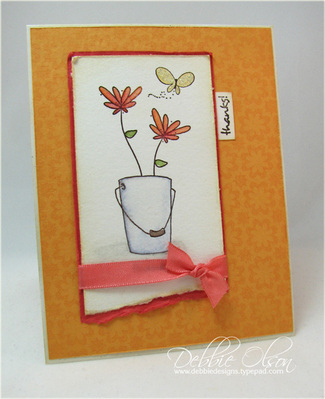 Anna came back the next day and brought me her newest stamp set, Posies for You, a Whipper Snapper release. These first two cards are both with Anna's set. 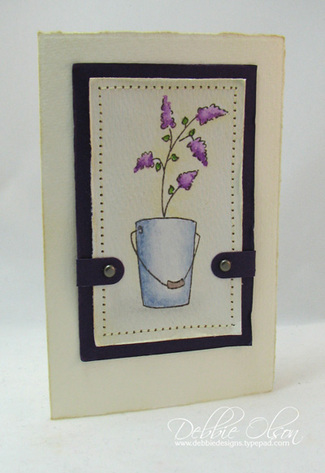 I also met Sam Wilkinson from GCS Artstamps; Trudee and I were demo-ing when Sam brought a couple of stamps by for us. 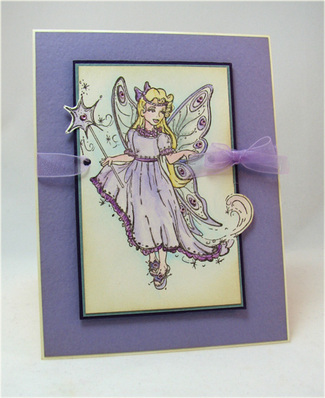 Mine was this nostalgic little fairy--perfect for an imaginative little girl! Sam said to let you know that they are working on a new website, but that you cam e-mail her if you would like a catalog. I'll probably have some Spica Glitter pens up as a giveaway this weekend--just letting you know ahead of time so that the Feedblitz readers find out in time. Thanks for visiting!